This public information is provided to provide full disclosure of financial arrangements between the University of Florida and Wells Fargo in compliance with Department of Education regulation 668.164(e). The financial agreement is considered a �T2� relationship as defined by the DOE. University of Florida and Wells Fargo have teamed up to offer you optional added banking convenience with your linked Gator 1 Card. This program offers you choices � you can choose to open an account and you can choose to link that account to your Gator 1 Card for banking access. Both optional services are available for your convenience. The Department of Education�s (ED) Cash Management regulations 34 CFR 668.164(d)(4)(i)(B)(2) (issued October 2015), require institutions participating in T2 (Campus Card) arrangements to list and identify the major features and commonly assessed fees as well as a URL for the terms and conditions of each financial account offered under the arrangement. University of Florida receives financial support from Wells Fargo for services associated with the Gator 1 Card to help offset costs. 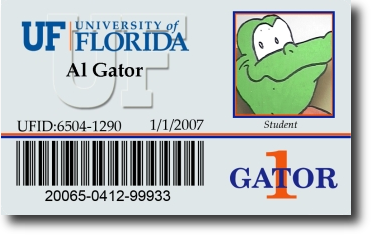 Students, faculty and staff are not required to open an account with Wells Fargo to receive or use the Gator 1 Card for other campus services. This page was last updated on 4/16/2019.